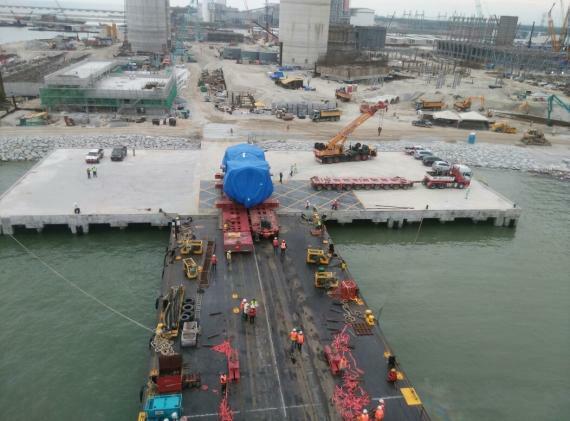 The Jimah East Power 2 x 1000mw Coal Fired Power Plant is a large project being undertaken by the EPCC of IHI-Toshiba-Hyundai Consortium and Megalift (members in Malaysia) are honoured to be appointed as the logistics provider to receive the cargo from Port Klang and handle the transport to the Jimah site. The cargo (photographed below) included 6 condenser lower shell units each at 7.00 x 5.30 x 9.60m and weighing 75tns and a generator stator measuring 10.95m x 6.80 x 5.47m and weighing 462tns. 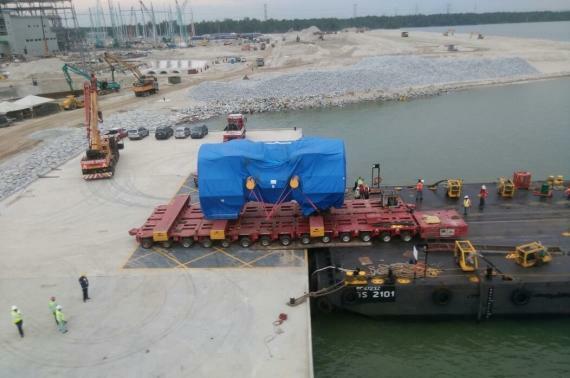 Nor Leily Jalaluddin (Overseas Agency Development at Megalift) explains; "We received the cargo via barges from the vessel in Port Klang before sailing them to the Jimah site jetty. They were then rolled off from the barges and transported to the ground site. 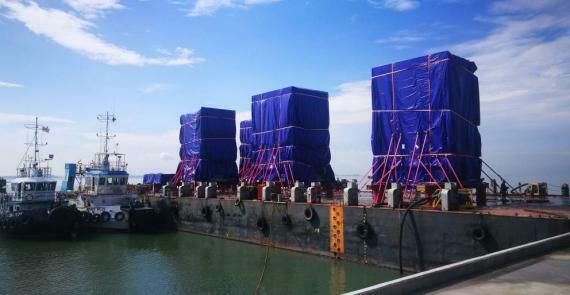 The operation required close monitoring and timely action due to the many constraints, particularly for the transport of the generator stator. 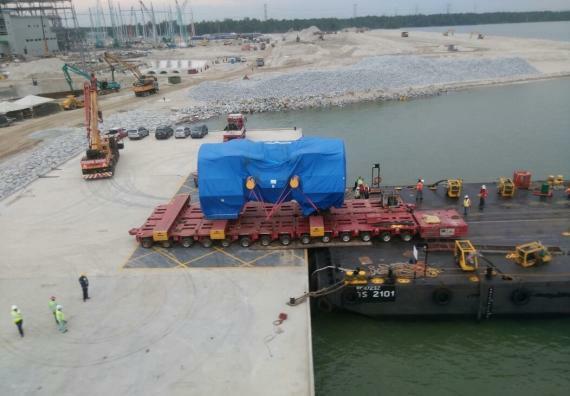 There was limitation of the vessel's derrick crane outreach radius and the challenge to find a suitable barge to receive the cargo as well as a timely RORO operation at the Jimah site jetty given the limited tide. The allowed barge width was within 60ft to make sure the vessel derrick crane could sit the generator stator onto the centre of the barge with minimal offset within the tolerance of the barge stability. We could not use a large barge with a depth of more than 16ft, which would have been ideal for the RORO operation. Therefore, due to the small barge that we were using, along with a limited tide, the operation team had to be very alert in monitoring and coordinating the movement. The uncertainties of vessel berthing and discharging the cargo onto the barge, along with the bad weather that slowed the sailing to the Jimah site jetty could have caused missing the tide for RORO operations. We literally experienced the saying 'time and tide wait for no man' but managed to successfully complete the operation in time."